This book is intended ior a one-semester or a two-quarter CSI course. Although it is written for students with no prior programming background, even experienced students will benefit from its depth of detail. 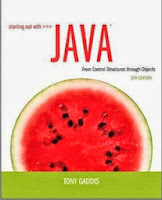 In Starting Out with Java: From Control Structures through Objects , Gaddis covers procedural programming control structures and methods before introducing object-oriented programming. As with all Gaddis texts, clear and easy-to-read code listings, concise and practical real-world examples, and an abundance of exercises appear in every chapter. This text first introduces the student to the fundamentals of data types, input and output, control structures, methods, and objects created from standard library classes. Next, the student learns to use arrays of primitive types and reference types. After ihis, the student progresses through more advanced topics, such as inheritance, polymorphism, the creation and management of packages, GUI applications, recursion, and database programming. From early in the book, applications are documented with javadoc comments, As the student progresses through the text, new javadoc tags are covered and demonstrated. As with all the books in the Starting Out With . . . series, the hallmark of this text is its clear, friendly, and easy to understand writing. In addition, it is rich in example programs that are concise and practical. introduces the student to databases and SQL using JavaDB. to switch on a string in Java 7 has also been added. Coverage of System.out.printf Has Been Expanded: The section on System.out.printf in Chapter 3 has been completely rewritten, and expanded to include diagrams and coverage of additional format specifiers. System.out.printf Is Primarily Used for Formatting Console Output: In this edition, System.out.printf is used as the primary method for formatting output in console programs. The DecimalFormat class is still introduced, but it is used to format numbers in GUI applications. Discussion of Nested Loops Has Been Expanded: In Chapter 4 the section on nested loops has been expanded to include an In the Spotlight section highlighting the use of nested loops to print patterns. Usage of Random Numbers Has Been Expanded: In Chapter 4 the section on random numbers has been expanded, and now includes In the Spotlight sections demonstrating how random numbers can be used to simulate the rolling of dice, and to determine the results of a coin toss. A New Introduction to Objects Has Been Added to Chapter 6: In Chapter 6, a new introduction to objects has been added to the beginning of the chapter. The new introduction is much more practical and concrete than the previous introduction, discussing Java objects that the student has already used. The goal of this new introduction is to show, in a familiar way, how programs consist of objects. This reinforces an object-oriented mindset, and prepares the student to write his or her own classes. New Motivational Examples of Classes Have Been Added to Chapter 6: In Chapter 6, new, motivational examples of classes have been added. One of the new examples introduces a Die class that simulates a die that can be rolled in a game. Another example shows how a variation of the game of Cho-Han can be simulated with classes that represent the players, a dealer, and the dice. Equipping GUI Applications with a Static main Method Is Introduced Earlier: In the First Look at GUI Applications chapter, which is now Chapter 12, the topic of equipping a GUI class with a static main method has been moved to a point very early in the chapter. New Exercises and Programming Problems: New shorter algorithm workbench exercises, and new motivational programming problems have been added to many of the chapters.